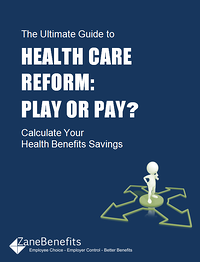 Free eBook: The Ultimate Guide to Health Care Reform: Play or Pay? Zane Benefits, the online alternative to group health insurance, announced today the publication of a free eBook "The Ultimate Guide to Health Care Reform: Play or Pay?" The new eBook outlines how businesses can understand their health benefits options, navigate health care reform compliance obligations and implement a cost-saving strategy for employee health benefits by 2014. To summarize, the Affordable Care Act includes an “employer mandate” for certain large employers to either offer health benefits or else pay a penalty. This is also called the “play or pay” requirement. The play or pay requirement means that an employer (with greater than 50 full-time equivalent employees) is required to either offer “qualified” and “affordable” health insurance to employees, or pay a tax penalty. The third option is to “play differently” via a defined contribution health plan. Should a business play, pay or play differently via defined contribution? The decision is not always easy or straightforward. Businesses want to offer health benefits that help recruit and retain key employees, but what can the business afford? How do the individual tax credits work? How can health care reform really lower the cost of health benefits? With the employer mandate and tax penalties, do businesses really have options? This comprehensive guide provides employers, owners, CEOs, human resource departments, insurance agents, and business consultants a road map to navigate these three health care reform options, and ultimately help businesses calculate health benefits savings.